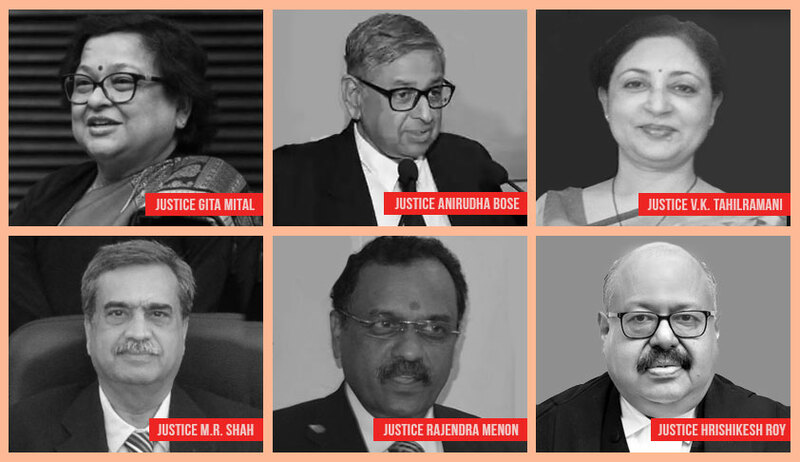 The Supreme Court collegium has recommended the appointment of Chief Justices for seven High Courts of the country. The Collegium comprising Chief Justice of India Dipak Misra, Justice Ranjan Gogoi and Justice Madan B. Lokur has recommended Acting Chief Justice of Delhi High Court, Justice Gita Mittal to be appointed as the Chief Justice Of Jammu and Kashmir High Court. With Justice Indira Banerjee’s expected elevation to the Supreme Court, the office of the Chief Justice of Madras High Court has been recommended to be handed over to Bombay High Court judge, Justice V.K. Tahilramani. In doing so, the Collegium took into consideration the fact that at present, there is only one Chief Justice from Bombay High Court, which is one of the biggest High Courts with sanctioned judge-strength of 94 judges. As for the vacancy arising due to Justice Vineet Saran’s elevation to the Supreme Court, Gujarat High Court judge, Justice K.S. Jhaveri has been recommended to be appointed as the Chief Justice of Orissa High Court. Justice Hrishikesh Roy, who is currently functioning as the Acting Chief Justice of Kerala High Court has been recommended to be appointed as the Chief Justice of Kerala High Court. While recommending him, the Collegium took into consideration the fact that at present, there is no Chief Justice from Gauhati High Court. The collegium has further recommended the appointment of Patna High Court Chief Justice Rajendra Menon as the Chief Justice of Delhi High Court, and Gujarat High Court judge, Justice M.R. Shah as the Chief Justice of Patna High Court. It also recommended the appointment of Calcutta High Court judge, Justice Aniruddha Bose as the Chief Justice of Jharkhand High Court, after the Centre rejected its recommendation to appoint Justice Bose as the Chief Justice of Delhi High Court. According to reports, the proposal to transfer Justice Bose to Delhi High Court was rejected by the Centre citing lack of experience.